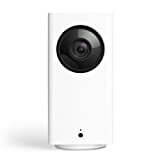 The Wyze Cam Pan 1080p Pan/Tilt/Zoom Wi-Fi Indoor Smart Home Camera became a best-seller on Amazon pretty much the instant it was released. Of course, it’s not exactly difficult to see why. This camera’s predecessor is the original Wyze Cam, a $26 camera that does everything you’d want a home cam to do, plus it includes an unprecedented 14 days of free cloud storage for video clips. The new model checks all the same boxes, but you can also pan and zoom remotely right from inside the Wyze app!